The Johns Creek Symphony Orchestra will conclude its 2018-2019 season with An Evening of French Music on Saturday, March 16, 2019. A special pre-concert talk will begin at 6:15 p.m. and the concert will begin at 7:30 p.m. The concert will take place at the Johns Creek United Methodist Church, 11180 Medlock Bridge Road in Johns Creek. The performance will be conducted by JCSO Founder and Music Director J. Wayne Baughman and Dr. Nathan Frank, guest conductor. Soloists include JCSO Concertmaster Adelaide Federici, organist Jeremy Rush, and the Johns Creek Chorale, directed by Nathan Frank. TICKETS for this public performance are $32 for adults; $27 for seniors; and $16 for students. Groups of 10 or more receive a 15% discount on tickets. For tickets, call (678) 748-5802 or visit www.johnscreeksymphony.org. The concert will open with Edouard Lalo’s Romance-Sérénade, which will feature JCSO Concertmaster Adelaide Federici on violin. The concert continues with Maurice Ravel’s Pavane for a Dead Princess. Right before intermission, the audience will hear Francis Poulenc’s Concerto for Organ, Timpani and Strings, featuring organist Jeremy Rush. The second half of the concert will feature the Johns Creek Chorale in Maurice Duruflé’s Requiem, Opus 9. The pre-concert presentation will be presented by consulting organist Randy Elkins, in partnership with Monte Nichols, beginning at 6:15 p.m. in the choir loft on stage. Mr. Elkins, who is originally from Roswell, Georgia, received both a bachelor’s and master’s degree in organ performance from the Jacobs School of Music at Indiana University. While he is currently the director of music ministry at Virginia-Highlands Church, Mr. Elkins was formerly the organist at Johns Creek United Methodist Church, where he was intimately involved in this organ’s selection, renovation, and relocation to the Johns Creek United Methodist Church. Monte Nichols, who is also a member of the JCSO Board of Directors, has many years of experience with the evening’s repertoire, as a vocalist with the Atlanta Symphony Orchestra’s professional Robert Shaw Chamber Singers and in 27 years as Worship and Music Pastor at Peachtree Corners Baptist Church. The presentation will include an up-close look at the organ, a review of its history, a discussion of how the instrument works, a live demonstration of the capabilities of the instrument (with the opportunity to feel the vibrations of the wooden paneling on stage), and a pre-concert Q&A session with attendees as time allows. The pre-concert presentation is free for all ticketholders of any hearing ability. Dr. Nathan Frank earned his undergraduate degree in voice at The University of North Texas. Venturing south to study conducting at Southern Methodist University, Nathan served as the Senior Teaching Fellow and the Tenor Section Leader for the SMU Chorale and completed his Master of Music Degree. Returning home to the University of North Texas, Nathan began his Doctorate of Musical Arts in Conducting. While at UNT, Nathan served as the Teaching Fellow for the Women’s Chorus and the Tenor Section Leader for the UNT A Cappella Choir. Nathan completed his Doctor of Musical Arts Degree in Choral Conducting with a related field in voice studies in 2014. Before moving to the Atlanta, Nathan has had teaching positions at Southern Methodist University, University of North Texas, Southeastern Oklahoma State University, and Pacific Lutheran University in Seattle, Washington. Nathan was active in the musical community of Dallas-Ft. Worth Metroplex. In Dallas, he was the Associate Conductor of Schola Cantorum of Ft. Worth. Most recently, he served as Director of Worship and Fine Arts at First United Methodist Church of Plano leading a music ministry of over 350 musicians. Dr. Frank is the Music Director of the Johns Creek Chorale. The Johns Creek Chorale has been guided by the vision of its creator, Dr. Nathan Frank, and performed its inaugural concert November 8, 2015. A dream of many in the community of Johns Creek, this new choral ensemble satisfies the growing need for high-level choral musicianship. 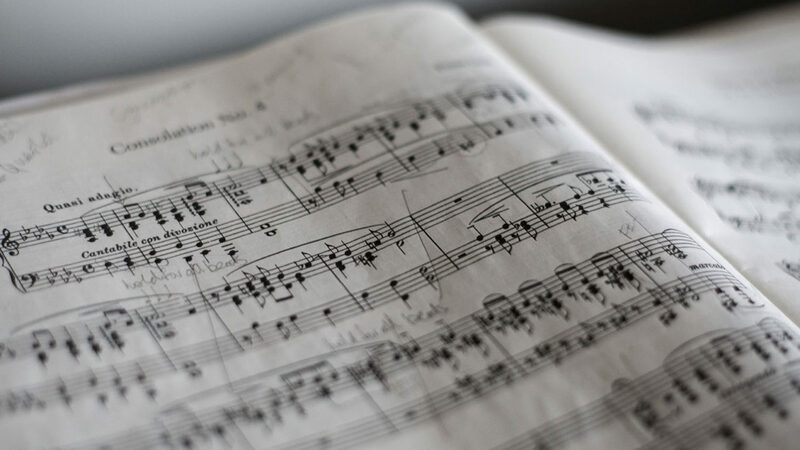 The chorale brings together approximately 70 men and women from diverse backgrounds to experience the joy of singing and to continue a life-long love for choral music. The chorale is on its way to becoming one of the premier choral groups in the greater Atlanta area. Jeremy Rush is principal organist at Johns Creek United Methodist Church. Mr. Rush studied Sacred Music, Choral Conducting, and Organ at Westminster College in New Wilmington, Pennsylvania, where he studied with John Walker and David Craighead. He is a career church musician and has served for over 25 years as organist, choirmaster, and/or hand bell director for congregations of 100 to 10,000 members in Pennsylvania, South Carolina, and Georgia. Mr. Rush had his first church organist job at age 13. At age 17, he was selected as one of only five students auditioned nationwide to perform at the National Convention of the American Guild of Organists. In 1996, he was the winner of the American Guild of Organists Young Artists’ Competition in Pittsburgh, Pennsylvania. Before joining the music staff of Johns Creek United Methodist Church in 2015, Mr. Rush served in various capacities at Northside United Methodist Church, Peachtree Presbyterian Church, and as Artistic Director of The Atlanta Concert Ringers. JCSO Music Director and Conductor J. Wayne Baughman studied choral and orchestral conducting, earning undergraduate and graduate degrees in music education from the University of Alabama, as well as advanced studies in conducting at the University of Michigan. Upon his arrival in Atlanta in 1974, Maestro Baughman immediately became involved with the Atlanta Symphony Orchestra and Choruses, and for 25 years he was a frequent vocal soloist, chorus member, and rehearsal conductor under the guidance of the late Robert Shaw. Well known for his oratorio performances as bass soloist, he collaborated with Maestro Shaw on numerous performance projects, including the Mozart Requiem Mass, J.S. Bach’s St. John Passion, and Handel’s Messiah. In 1990, as bass soloist, Maestro Baughman shared the honor of a Grammy Award for the Telarc recording of Belshazzar’s Feast (Walton) and Chichester Psalms (Bernstein) with Robert Shaw and the ASO. Maestro Baughman has held conducting positions at the State University of New York at Cortland and Brevard Music Center. He also served as music director at Peachtree Christian Church in Atlanta for nine years, where his performances of major choral-orchestral works received critical acclaim. Maestro Baughman is recently retired from liturgical music. Now in its twelfth season, the Johns Creek Symphony Orchestra is metro Atlanta’s only fully-professional, part-time symphonic orchestra, made up of professional musicians from all over the greater metro Atlanta area. The Johns Creek Symphony Orchestra, conducted by Founder and Music Director J. Wayne Baughman, provides musical enrichment for the community of Johns Creek through a three-concert series of performances, as well as additional educational programs and special events each year. The Johns Creek Symphony Orchestra will continue its 2018-2019 season by celebrating the Most Wonderful Time of the Year with CHRISTMAS GALA HOLIDAY POPS on Saturday, December 15, 2018 at the Johns Creek United Methodist Church, 11180 Medlock Bridge Road in Johns Creek. Doors will open at 6:45 p.m. for the littlest ticketholders to visit with Santa from 6:45 p.m. to 7:30 p.m. The concert begins at 7:30 p.m. A complimentary post-concert reception will follow in the church’s Gathering Room. 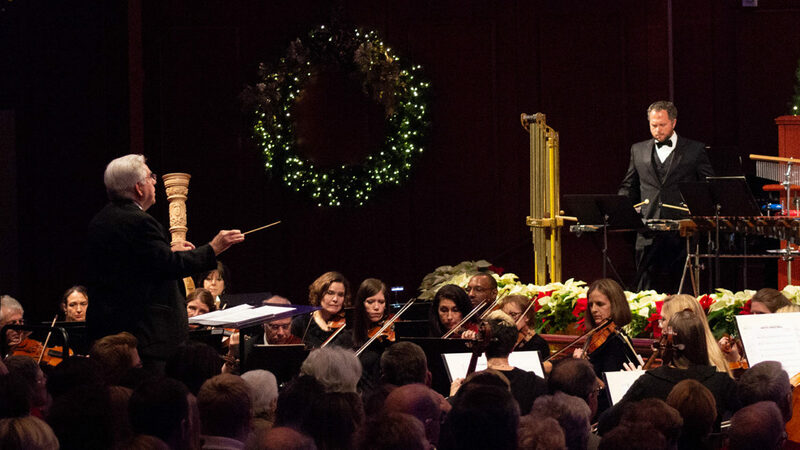 This family-friendly concert, conducted by Johns Creek Symphony Orchestra Music Director J. Wayne Baughman, will include holiday favorites that will be enjoyed by both the young and young-at-heart. 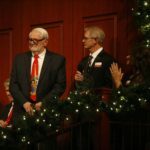 In the Boston Pops style, this performance will include a variety of seasonal, sacred, and secular music, including “Joy to the World,” “Carol of the Bells,” “Festival Gloria,” “White Christmas,” “Sleigh Ride,” and much more. Guest artists include soprano Caitlin Hammon Moore, Johns Creek Chorale and Tapestry Women’s Ensemble, both of which are directed by Nathan Frank. This concert will be a drop site for the 2018 Atlanta Toys for Tots campaign. All ticket holders are encouraged to bring a new, unwrapped toy to the performance for an Atlanta child in need. TICKETS for this public performance are $32 for adults; $27 for seniors; and $16 for students. Groups of 10 or more receive a 15% discount on tickets. For tickets, call (678) 748-5802 or visit www.johnscreeksymphony.org. This concert is extremely popular, and patrons are strongly encouraged to purchase their tickets well in advance. Upon his arrival in Atlanta in 1974, Maestro Baughman immediately became involved with the Atlanta Symphony Orchestra and Choruses, and for 25 years he was a frequent vocal soloist, chorus member, and rehearsal conductor under the guidance of the late Robert Shaw. Well known for his oratorio performances as bass soloist, he collaborated with Maestro Shaw on numerous performance projects, including the Mozart Requiem Mass, J.S. Bach’s St. John Passion, and Handel’s Messiah. In 1990, as bass soloist, Maestro Baughman shared the honor of a Grammy Award for the Telarc recording of Belshazzar’s Feast (Walton) and Chichester Psalms (Bernstein) with Robert Shaw and the ASO. Maestro Baughman has held conducting positions at the State University of New York at Cortland and Brevard Music Center. He also served as music director at Peachtree Christian Church in Atlanta for nine years, where his performances of major choral-orchestral works received critical acclaim. Maestro Baughman is recently retired from liturgical music. JCSO Begins 18-19 Season with MAESTRO AND FRIENDS! Johns Creek, Georgia– The Johns Creek Symphony Orchestra will open its 2018-2019 season with “Maestro and Friends,” featuring the JCSO String Quartet and Friends, on Saturday, October 27, 2018 at 7:30 p.m. at the Johns Creek United Methodist Church, 11180 Medlock Bridge Road in Johns Creek, Georgia. 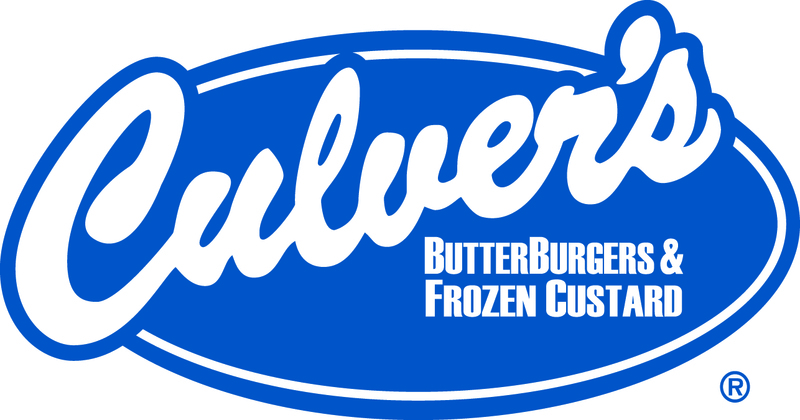 Maestro J. Wayne Baughman will give a pre-concert talk beginning at 6:45 p.m., and the concert will be followed by a complimentary reception, sponsored by Culver’s of Johns Creek. This concert is presented by Emory Johns Creek Hospital. The concert will be an uplifting evening of chamber works, including Dvorak’s String Quintet in G Major and Mendelssohn’s Octet in Eb Major. Featured musicians include Adelaide Federici, Alison James, Peter Ciaschini, and Lee Taylor, violins; Cindy Beard and Kate Feltgen, violas; Sarah Kapps and Martin Gueorguiev, cellos; and Todd Markey, bass. TICKETS for this public performance are $32 for adults, $27 for seniors 55+, and $16 for students. For tickets, call (678) 748-5802 or visit www.johnscreeksymphony.org. Johns Creek, Georgia– The Johns Creek Symphony Orchestra announces that Ting Chiu and Vicki Horton have been appointed as the newest members of the orchestra’s Board of Directors. William Abely, Treasurer – Leapfrog Services, Inc.
Back in 2003, Ting Chiu was a contented Montessori teacher. With her caring attitude and devotion to education, this talented, well-educated woman was making a name for herself in her career. An unfortunate event changed her view on life, realizing that people needed basic financial literacy. With the help of World Financial Group, she took up the cause of educating people with financial knowledge and providing solutions to build and protect wealth for families. She quickly evolved into a more decisive, inspirational leader, receiving honors and accolades, because she believes that people can always be helped by teaching them the basics of personal financial strategies. Ting, who has impeccable personal ethics, with well-developed principles of strong family values, is changing families’ lives in very positive ways and, with her business skills and abilities, has helped others become proponents of financial literacy as well. Indeed, this selfless dedication, hard-work, and single-minded focus on her cause helped Ting get her promotion to Executive Vice Chairman in 2015. She is currently managing over 300 licensed agents across 15 states and serving clients in over 30 states. She added to her qualifications by receiving her designation as a Certified Financial Educator (CFEd), by becoming a Certified College Planning Consultant, and by becoming a Registered Representative with Transamerica Financial Advisors, Inc. Ting, highly regarded in her community, is active in her church and is involved in several nonprofit organizations. Vicki Horton has been a professional site selection consultant for 25 years. She is an entrepreneur and a business owner. Through her businesses she assists her corporate clients with supply chain optimization, entry into the US market, location strategy, community evaluation, site selection, real estate negotiation, and economic development incentive negotiation and collection. She also works with community, regional, and state leadership conducting economic development strategy and implementation plans and funding of projects. In her 25 plus year career, Vicki has worked for well-known site selection firms including The Austin Company, Fantus Consulting, Deloitte and Touche, SC&H Group, and Crowe Horwath. She also spent a portion of her career as the Director of Network Strategy for a nationally known consumer products company. As Managing Partner with Myriad Partners, she works with communities, assisting them with land use strategy, infrastructure development, community and economic development strategies and funding/financing. In addition, she helps corporate clients and communities establish apprenticeship programs and assists in educating economic development stakeholders. This includes educating public officials on how companies make location decisions and how to develop sound economic development, land use, and infrastructure practices that are specific to their city and support the vision of their residents. Vicki works with Fortune 100, 500 and middle market companies. Some of her current and past clients include Porsche, Cox Enterprises, PPD, HCA, ConAgra, Hobart, Avery Dennison, Russell Stover, Under Armour, Springs Industries, ADP, Chicos, Simmons, Fisher Scientific, Owens Corning, Gaylord Entertainment, and AOL. Vicki earned a Bachelor of Science degree from University of Akron and a Masters of Public Administration degree from Cleveland State University. She is an active member of the Industrial Asset Management Council (IAMC), The Association of Operations Management (APICS), The Council of Supply Chain Management Professionals (CSCMP), International Tax Professionals (ITP) and the Urban Land Institute (ULI). She is a part-time professor for International Economic Development Council (IEDC) and teaches annually at Colorado State University, Georgia Institute of Technology, and University of North Carolina. She also is on the faculty of the United States Chamber of Commerce and teaches at University of Georgia. She teaches courses on Site Selection and Economic Development and public/private collaboration. Vicki is a paid speaker, professor and an award winning published author. Her award-winning book, The One You Feed, is a compilation of short stories, reflection questions and quotes designed to assist in the development of key character traits in children ages 7 to 14. In 2013, The One You Feed won the National Indie Excellence Award in the categories of Young Adult Non Fiction for content and Book Cover Non Fiction. The Johns Creek Symphony Orchestra is bringing back our popular 4-course dinner/cooking extravaganza—“Culinary Fantastique”—on Saturday, November 3, 2018 from 6:00 p.m. to 8:00 p.m. at the Publix Aprons Cooking School at Alpharetta Commons, 4305 State Bridge Road. The theme for this 4-course meal (paired with specially-selected wines) will be holiday cooking, featuring mouth-watering new twists on traditional recipes. 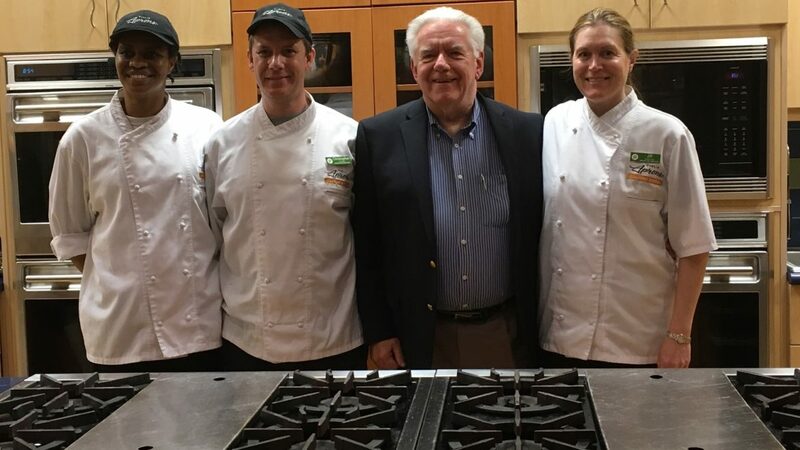 “Our first culinary event in April was so well received that we decided to bring it back for the holidays,” remarked JCSO Executive Director Linda Brill. “Just like seasonal music, the tastes of the holidays evoke memories of simpler times shared with friends and loved ones. We wanted to capture that intimate feeling in a 4-course dinner featuring recipes that cooks can share at their own holiday tables.” All proceeds from this fundraising event benefit the Johns Creek Symphony Orchestra. The evening will be a feast for both the eyes and the ears, as attendees will be treated to parlor-style musical performances by individual Johns Creek Symphony Orchestra musicians at periodic breaks in the evening. Attendees will also learn the backgrounds of the various dishes they are eating, how to prepare each one at home, special cooking techniques, and at the conclusion of the evening they will receive the recipes plus a coupon for a 20% off cooking items purchased from the Publix Aprons Cooking School. ADMISSION to this special event is $75 per person. While the RSVP and pre-payment deadline is not until Monday, October 29 at 5 p.m., only 48 seats will be sold so patrons are encouraged to reserve their place at the table early. Reservations can be made by visiting www.JohnsCreekSymphony.org or by calling (678) 748-5802. No tickets will be sold at the door. *JCSO is a 501(c)(3) nonprofit organization. For tax purposes, this event has a value of $45 per person. Any amount donated over $45 per person is deductible to the extent permitted by law. Johns Creek, Georgia– The Johns Creek Symphony Orchestra is pleased to announce our 2018-2019 season! 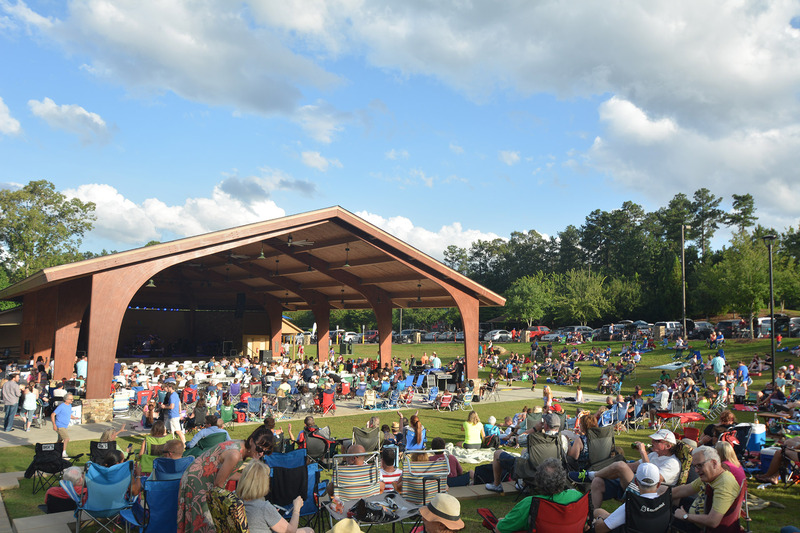 The season will open with a FREE concert on the City of Johns Creek’s Summer Concert Series at Newtown Park on Saturday, October 6, 2018 at 7 p.m., followed by three subscription concerts, which will take place at the Johns Creek United Methodist Church, 11180 Medlock Bridge Road in Johns Creek. Saturday, October 6, 2018 at 7:00 p.m. Gates open at 6:00 p.m.
Join us at the Newtown Park Amphitheater for a FREE concert of American music – from Broadway to Sousa to Jazz – on the City of Johns Creek’s Summer Concert Series. For more information, visit www.johnscreekga.gov. This concert is presented by the City of Johns Creek, with additional support from the Rotary Club of Johns Creek-North Fulton and the Stuart Perry Agency, Farmers Insurance. Sat., Oct. 27, 2018 | 7:30 p.m.
Don’t miss a lovely evening of chamber music, featuring Dvorak’s Quintet Op. 77 and Mendelssohn’s Octet, Op.20, featuring JCSO musicians and Maestro Baughman as emcee. This concert is sponsored by Emory Johns Creek Hospital. Sat., Dec. 15, 2018 | 7:30 p.m.
Bring the whole family to our celebration of the Most Wonderful Time of the Year! This concert features the Johns Creek Chorale, sing-alongs, and special guests in an unforgettable Johns Creek holiday tradition. 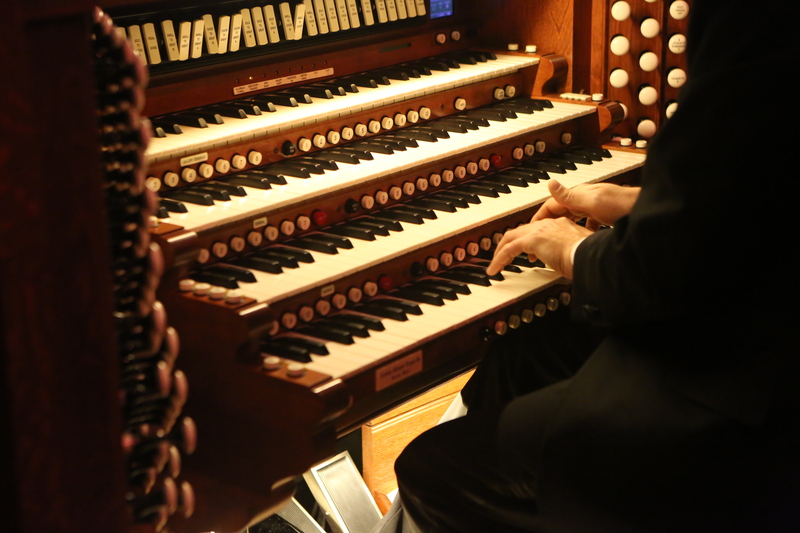 Sat., March 16, 2019 | 7:30 p.m.
Feel the power and the beauty of the magnificent Johns Creek United Methodist Church’s organ, rescued from the devastation of NYC’s Ground Zero. This magnificent instrument will take center stage in Poulenc’s Concerto for Organ, Timpani, and Strings, performed by organist Jeremy Rush. Also on the program is Maurice Duruflé’s hauntingly beautiful Requiem, in which we feature the Johns Creek Chorale. All subscription performances are held at the Johns Creek United Methodist Church, 11180 Medlock Bridge Road in Johns Creek, Georgia. 3-concert Subscriptions (On sale now) are $77 for adults; $65 for seniors; and $24 for students. Individual Concert Tickets (On-sale date: August 15) are $32 for adults; $27 for seniors; and $16 for students. For tickets, call (678) 748-5802 or visit www.johnscreeksymphony.org. We’re pleased to announce that Marianne de Vargas has been appointed to the JCSO Board of Directors, effective March 15, 2018! William Abely, Treasurer – Financial Analyst, Leapfrog Services, Inc.
Marianne F. de Vargas is a retired clinician, educator and work/family strategies administrator; a trainer, team builder, and fundraiser with more than 20 years’ experience in community, family and educational development. This experience is not limited to supervision, curriculum development, training of trainers and implementation and interaction with educational, family, non-profit, government and business communities. In addition to being a consultant for The Vargas Group, Ms. de Vargas is a published writer and former Adjunct Professor of Early Childhood Education at Kennesaw State University in Kennesaw, Georgia; developer and President of Work/Family Strategies, Inc., in Fort Myers, Florida; Family Therapist/Educator and Clinical Staff Supervisor at the Ruth Cooper Center for Behavioral Health in Fort Myers, Florida; Manager of Early Childhood Education at the Dimock Community Health Foundation in Boston, Massachusetts; and Clinician and Life Skills Educator for the Futures for Young Parents Program in Somerville, Massachusetts. Ms. de Vargas has always been involved in community activities and with professional associations, such as the Johns Creek Arts Center, where she served as a Board Member and Chair of the Governance Committee. De Vargas is a former member and President-elect of the Board of the Georgia Highlands Medical Center. 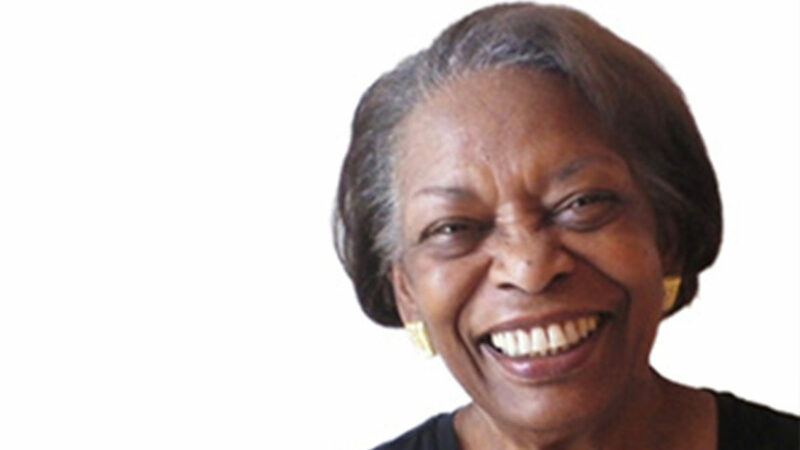 Previous affiliations have included the Curriculum committee of the Lee County School Board, where she chaired the Math/Science Development Project; the Ruth Cooper Behavioral Health Center, chairing the Cultural Competency Committee; the Florida Gulf Coast Writers Association where she was Vice President/Treasurer; the Literacy Volunteers, and the Citizen’s Advisory Committee to the Commissioners of Lee County, Florida. For the past 10 years, Ms. de Vargas has made her home in Forsyth County/Johns Creek where she enjoys continuing community involvement and activities with her husband, children, grandchildren and friends. 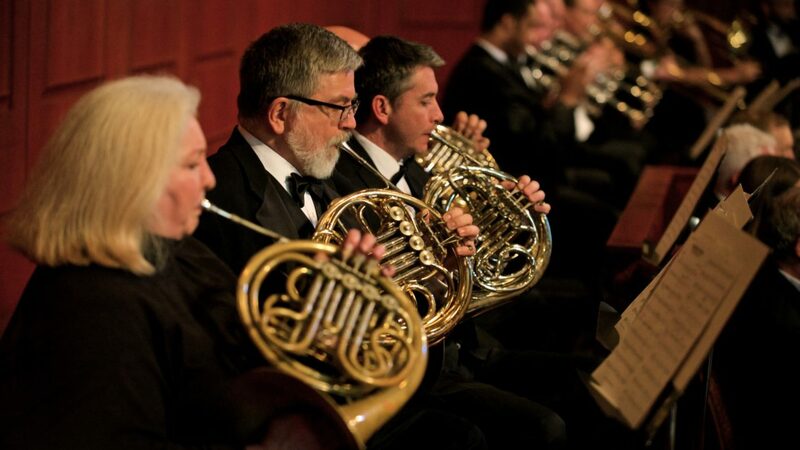 Now in its eleventh season, the Johns Creek Symphony Orchestra is metro Atlanta’s only fully-professional, part-time symphonic orchestra, made up of professional musicians from all over the greater metro Atlanta area. The Johns Creek Symphony Orchestra, conducted by Founder and Music Director J. Wayne Baughman, provides musical enrichment for the community of Johns Creek through a three-concert series of performances, as well as additional educational programs and special events each year. Season Finale to be a Musical Tour of the U.S.A., with Roger Wise as narrator. JCSO to Collect Donated Food Items at Concert for North Fulton Community Charities Food Pantry as part of “Orchestras Feeding America” National Campaign. 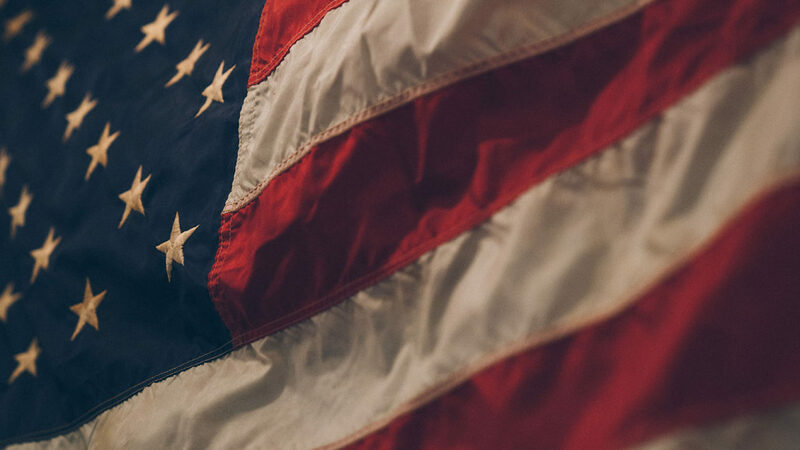 Johns Creek, Georgia– The Johns Creek Symphony Orchestra will conclude its 2017-2018 season on Saturday, May 12, 2018 at 7:30 p.m. with a program titled “The American Dream” at Johns Creek United Methodist Church, 11180 Medlock Bridge Road in Johns Creek. The program, conducted by Maestro J. Wayne Baughman, will feature Roger Wise as narrator and Brent Davis, baritone. This program is supported in part by the Georgia Council for the Arts through the appropriations of the Georgia General Assembly. GCA also receives support from its partner agency – the National Endowment for the Arts. To find out more about how National Endowment for the Arts grants impact individuals and communities, visit www.arts.gov. Additional support comes from the Rotary Club of Johns Creek North Fulton. TICKETS for this public performance are $32 for adults; $27 for seniors; and $16 for students. Group rates are available for groups of 10 or more. For tickets, call (678) 748-5802 or visit www.johnscreeksymphony.org. In conjunction with this performance, the Johns Creek Symphony Orchestra has joined forces with 36 other orchestras across America as part of the “Orchestras Feeding America” national campaign spearheaded by the League of American Orchestras. “We are encouraging our audience members to bring nonperishable food items to this performance, which we will collect and transport to North Fulton Community Charities Food Pantry. Many people in our community are struggling to achieve the American Dream, and we’d like to lend a helping hand by joining this national initiative,” said Brill. North Fulton Community Charities distributes more than 9 tons of food and staple goods each week. NFCC’s pantry most needs: pasta sauce, rice, and toothpaste. Canned goods: potatoes, spinach, collards, beets, carrots, mixed veggie pea/carrot combo, sweet potatoes/yams, tomato sauce/paste, ramen noodles, Hamburger Helper-type meals, corn meal, grits. The League of American Orchestras first joined forces with Feeding America, the nation’s largest hunger relief organization, in 2009. More than 215 orchestras in all 50 states participated in an unprecedented coordinated effort by collecting and donating food to their local food assistance agency or food bank within Feeding America’s network of more than 200 food banks and 60,000 agencies. 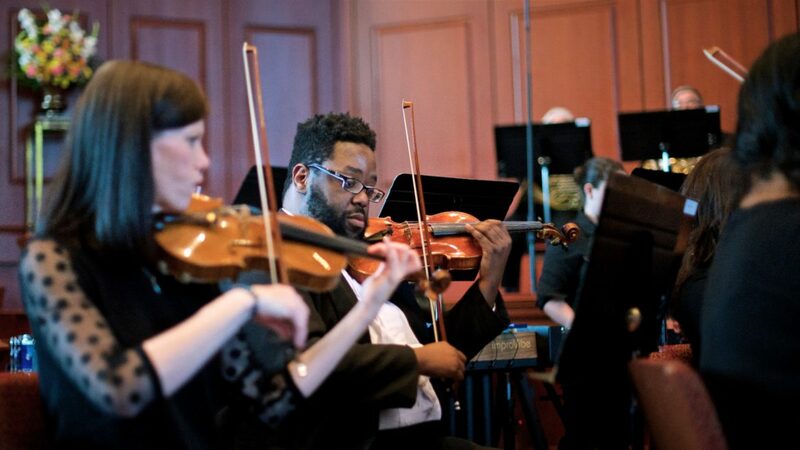 Since then, over 360 orchestras have participated in the annual effort. Roger Wise is originally from Goldsboro, North Carolina, and he attended Goldsboro High School and East Carolina College. Roger had a successful 30-year career with the Ross division of Abbott Laboratories. He retired as the Southeast Regional Manager of Academic and Government Services. Roger and his wife, Claire Jo, have been married for 45 years. They have lived in the Horseshoe Bend community of North Fulton County for 35 years. They have three grown children and five grandchildren. During his 35 years in Fulton County, Roger has been a member and chairman of the Fulton County Housing Authority and the Fulton County Planning and Zoning Commission. He has been an active citizen, working with many leaders and the membership of local organizations. He is on too many boards to mention and is the ambassador to the community at large for numerous organizations. Roger has worked with government officials at all levels on countless projects and ideas that have benefitted our community and the state of Georgia. He is always available to move a project forward and to see it through to a successful conclusion. Roger has helped so many individuals and organizations around the state to become better leaders, and in so doing his efforts have created stronger organizations through stronger leadership. He has worked directly with leaders and members of the Johns Creek, Roswell, Alpharetta and Milton communities. Roger has always been available to work with elected officials and organizations to promote good ideas that benefit the citizens of North Fulton. In so doing he has promoted, assisted with, and worked with just about every organization in the cities and communities of North Fulton. Roger is known as “Georgia’s Mr. Facilitator – The Go to Guy” who always gets the job done in the best possible way. An Army veteran, Roger is the ambassador for Post 201 of the American Legion and is always an active participant in recognizing and assisting our community in giving special recognition to our local men and women who serve in our military. He is the national ambassador for the Shriners Hospital System, the Shriners of Georgia, and the Masons of Georgia, always working tirelessly to support our greatest natural resource – our children. Roger pays his civic rent. Georgia is a better place because of his contributions to his community, county, state, and nation. Baritone Brent Davis, a Georgia native, made his professional debut with The Atlanta Opera in 2004 and has since performed with opera companies and orchestras locally and abroad. Mr. Davis has collaborated on projects with the National Endowment for the Arts and Meridian Herald, and performed in company premieres with The Atlanta Opera in Akhnaten and Cold Sassy Tree with the rare opportunity to work with composer Philip Glass and Carlisle Floyd. Last season included performances with Meridian Chorale featuring soprano Jessye Norman and tenor Timothy Miller, Dona Nobis Pacem with Michael O’Neal Singers and Georgia Philharmonic, and a Patriotic Concert with Atlanta Wind Symphony and Roswell UMC Sanctuary Choir. This season includes Brahms’ Requiem with Michael O’Neal Singers and Songs of Brotherhood concert with Mark Miller Band and tenor Timothy Miller at Roswell UMC Chapel. Mr. Davis received his Master of Music degree from University of Illinois and Bachelor of Music from Clayton State University, and has worked extensively with acclaimed Metropolitan Opera baritone Frederick Burchinal. First-ever Matinee Performance to include Pre-concert Talk and Post-concert Reception. 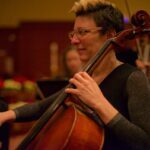 Johns Creek, Georgia– The Johns Creek Symphony Orchestra will continue its 2017-2018 season with “Virtuoso Strings,” featuring the Johns Creek Symphony Orchestra’s very own string section on Sunday, March 11, 2018 at 3:00 p.m. at the Johns Creek United Methodist Church, 11180 Medlock Bridge Road in Johns Creek, Georgia. TICKETS for this public performance are $32 for adults; $27 for seniors; and $16 for students. Group rates are available for groups of 10 or more. For tickets, call (678) 748-5802 or visit www.johnscreeksymphony.org. The price of admission includes a pre-concert talk beginning at 2:15 p.m. as well as a complimentary post-concert reception hosted by the Friends of the Johns Creek Symphony Orchestra. In addition to the change in day and time of this performance, the Symphony is adding a pre-concert talk to this event, conducted by JCSO cellist Sarah Kapps. Ms. Kapps, a native of Philadelphia, has an active and diverse musical background that has taken her across much of the globe as soloist, chamber musician, and orchestral member. She holds degrees from The Manhattan School of Music and The Mannes College of Music, and has studied with Paul Tobias and Peter Wiley of the Guarneri Quartet. She now lives in Atlanta and serves on the faculty at the William Pu Music Academy. She has performed with JCSO since 2010. The music for “Virtuoso Strings” will include pieces that highlight the virtuosity and exceptional artistry of the Johns Creek Symphony Orchestra’s very own performers. JCSO musicians are among the finest instrumentalists in America, with an average of 16 years’ experience in professional orchestras. Most of the members have graduate degrees or artist diplomas in performing arts from the leading institutions of higher learning in the U.S., and many have received additional training in Berlin, London, Rome, Salzburg, Vienna, and other leading European music centers. Perhaps the most widely-known piece on the concert is Gustav Holst’s Saint Paul’s Suite, written while the composer was in residence as music director of the St. Paul’s Girls’ School in London, England. The concert also includes the lovely, romantic Serenade Op. 6 by Czech composer Josef Suk; British composer Peter Warlock’s Capriol Suite, based on a suite of six Renaissance dances; and Argentine composer Astor Piazzolla’s lively and poignant Tango Ballet. “This concert may be the most enjoyable to play and to listen to that we perform all season long,” said Music Director J. Wayne Baughman. 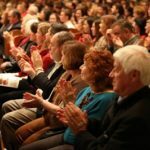 Johns Creek, Georgia– The Johns Creek Symphony Orchestra will open its 2017-2018 subscription season with its annual “Christmas Gala Holiday Pops,” featuring the Christmas Gala Chorus and guest vocalist Timothy Miller on Saturday, December 16, 2017 at 7:30 p.m. at the Johns Creek United Methodist Church, 11180 Medlock Bridge Road in Johns Creek, Georgia. This family friendly concert, conducted by Johns Creek Symphony Orchestra Music Director J. Wayne Baughman, will include an audience sing-along and holiday favorites that will be enjoyed by both the young and young-at-heart. 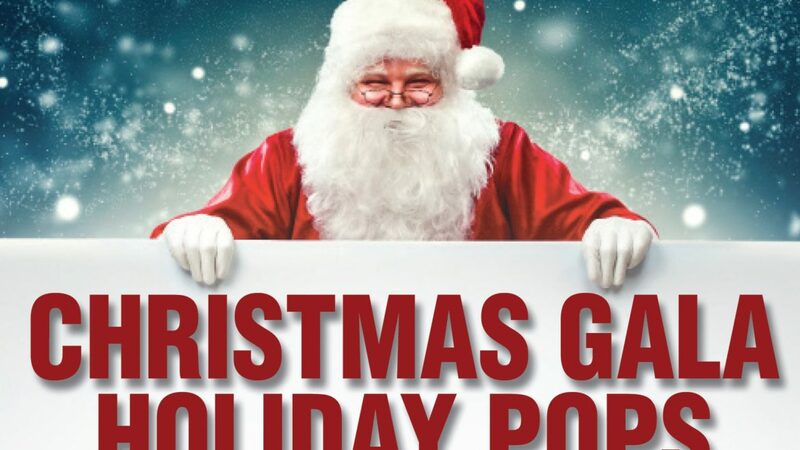 In the Boston Pops style, this performance will include a variety of seasonal, sacred, and secular music, including John Rutter’s “Star Carol,” Leroy Anderson’s “Christmas Festival,” Irving Berlin’s “White Christmas” and “Sleigh Ride,” among many others, filling the audience with the wonder and awe of the holiday season. TICKETS for this public performance are $32 for adults; $27 for seniors; and $16 for students. For tickets, call (678) 748-5802 or visit www.johnscreeksymphony.org. This concert is extremely popular every year, and patrons are strongly encouraged to purchase their tickets well in advance. Timothy Miller is an active performer with both national and international credits. Operatic roles include Monastatos and First Armored Man in Mozart’s Die Zauberflӧte, Street in Davis’ X: The Life and Times of Malcolm X, Un Messaggero in Verdi’s Aida, and Parpignol in Puccini’s La Boheme. In June of 2008, Mr. Miller sang the role of Crab Man in critically-acclaimed performances of Porgy and Bess at the Opéra-Comique in Paris and on tour in Luxembourg, Granada, and Normandy. He has also appeared in concert performances of Handel’s Messiah, Bach’s Magnificat, and a concert version of excerpts from Richard Strauss’ Der Rosenkavalier, performed with the Atlanta Symphony Orchestra. In March 2013 Mr. Miller sang the role of Comrade Alexander Ossipon in the world premiere of Curtis Bryant’s The Secret Agent with libretto by Alan Reichman. Perhaps most widely recognized for his stirring renditions of “God Bless America” during the seventh inning stretch of Atlanta Braves home games, Timothy Miller has extended his exposure well beyond the concert stage. Soloist for the 2011 Georgia Gubernatorial Inauguration Ceremony, featured artist promos for Cartoon Network’s Adult Swim, and featured artist in the December 2012 edition of The Atlantan Magazine “Patrons and Players” rounds out a growing list of memorable career highlights. In April 2016, Mr. Miller made his debut with the Georgia Symphony as tenor soloist in Beethoven’s Ninth Symphony. 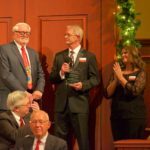 The Christmas Gala Chorus is a volunteer ensemble that unites each year for the purpose of performing on the Johns Creek Symphony Orchestra’s Christmas Gala concert. Comprised of experienced vocalists from every walk of life and from many neighborhoods in the Atlanta metro area, this talented group of singers rehearses during the months of November and December in preparation for this popular holiday performance.